OSWEGO, NY (March 17, 2018) - Yet another Small Block Supermodified veteran is set to make the move up to Oswego Speedway’s premier division as Proud Motorsports and driver Camden Proud have acquired the potent Strong Racing No. 99 Supermodified which last appeared at the speedway on Classic Weekend in 2016. The 2010 Hawk Chassis has been driven to two Oswego victories by Michael Barnes in 2012 and has also been piloted by Dave Cliff and Joey Payne as well, with Payne notably bringing the orange and purple racer home on the podium as part of the 2015 Budweiser International Classic 200. After much discussion with his father and Proud Motorsports team owner Tim Proud, the 19 year-old explained how his family got to the big decision. Proud’s original interest was purchasing Pat and Terry Strong’s other team car, which is a West Chassis 4-Bar that still remains for sale. The plan was to make that roller a 350 Supermodified for Classic Weekend, but the former Pathfinder Bank SBS Rookie of the Year says he just “thought better of it” and turned his head to look at the newer big block car instead. Since December, both Tim and Camden have been involved in several discussions with Strong Racing while making multiple trips out to the team’s Scriba race shop in an effort to strike a deal on the accomplished family-owned racer. After months worth of careful deliberation, the deal was finalized this past week and the No. 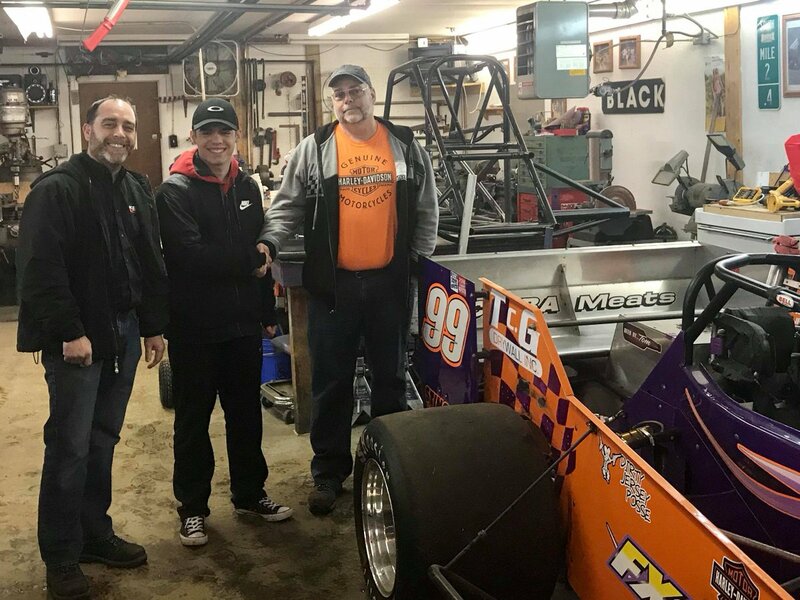 99 was rolled into Proud Motorsports’ shop in the City of Oswego. The current speedway public relations director went on to explain that timing was everything in being able to acquire the Supermodified, and had it not been for his parents’ support along with that of Ken’s Body Shop in Oswego, the addition of a Supermodified to the Proud Motorsports stable would not be possible. Although Proud Motorsports will not be racing two cars next season, you can expect to see both the Supermodified and the SBS rolled to the track this year. Following several track testing sessions, Camden intends to pull ‘double duty’ on an occasion or two leading up to the 62nd running of Budweiser International Classic Weekend. Proud’s goals this season with the Supermodified are to log laps, get lots of seat time, and more importantly than anything else, get acclimated and adjusted behind the wheel of what is an entirely different race car compared to anything he has driven in his career. Whether or not the car will compete in a race this season will be determined solely on Proud’s progress and how the track testing goes, which Camden believes will start in mid to late July should the assembly process run smoothly after the entire car is gone through from top to bottom. The Strong Racing No. 99 locked in to the 2015 Classic with a lap of 16.5 seconds before going on to finish in third place. Proud knows that should he qualify for the 200-lap event, he will be doing so with a car that has potential to win the race and discussed in depth the cars’ setup advantages and disadvantages, along with what his personal goals would be should the team be prepared enough to compete on Classic Weekend. As some fans may recall, Proud Motorsports has owned a Supermodified before, from 1998 to 2002. That car was numbered 22 and then 04 for several seasons and under several different paint schemes with Tim along with SBS icon Mike Bond each getting behind the wheel. This new ride for Camden will certainly have shades of his father’s Super days as the team plans to bring back the No. 04 to the Novelis Supermodified division. Tim got his Supermodified start behind the wheel of the Doug Didero backup car owned by Skip Matczak back in August 1997, driving to a fifteenth place finish in his first ever Oswego event. He then purchased a new Howard Page Chassis for the 1998 season, before putting SBS standout Bond in the car to go on to win the 1999 Supermodified Rookie of the Year title. Proud returned to qualify nineteenth out of forty four cars for the 2000 International Classic before being crashed out while running inside the top fifteen. After two seasons of part time action in 2001 and 2002 highlighted by a career best eleventh place finish on Opening Day of ‘01, Tim hasn’t seen Supermodified action since, but that may soon change. For up to date information about both the Proud Motorsports No. 54 Small Block Super along with the new addition of the No. 04 Supermodified, you can check out the team’s website at ProudMotorsports.com. Proud Motorsports also has a healthy social media presence which you can join by clicking FOLLOW on Twitter @ProudMtrsports or LIKE on Facebook at Facebook.com/ProudMotorsports. Oswego Speedway kicks off its 2018 campaign on Saturday, May 26 which will see the track’s 68th annual Opening Day set to include Jim Shampine Memorial Twin 50’s for the Novelis Supermodifieds plus the Tony White Memorial 35 for the Pathfinder Bank SBS. To purchase tickets, please call (315)-342-0646. Season tickets, camping passes, and more are all on sale as part of Oswego Speedway's 2018 schedule. These items can be picked up and purchased in the speedway office from 11am to 4pm on Saturdays during the winter.